The holiday home “Finca La Mora” is situated in the small village of Tejina de Isora in the sunny south-west of Tenerife. It is ideally located for excursions to the former abandoned village Las Fuentes, the sunny beach of Playa San Juan, the Cañadas as well as exploring the North of the island. Finca La Mora is situated beside the natural reserve “Monumento Natural de la Montaña de Tejina”. You'll stay amidst magnificent nature and pastoral tranquility. With a view of the islands of La Gomera, La Palma and El Hierro, which you can enjoy from the terrace or from the swimming pool. The house consists of a comfortable kitchen with a dining area, living area, two bedrooms and two bathrooms. The kitchen has everything you could need, including a dishwasher, oven/grill, microwave and a fridge/freezer. In the living room you will find a satellite TV, a HiFi equipment as well as a DVD player. The house has air conditioning which also doubles up as heating during the few cooler days in the winter months. In the living room there is as well a wood burning stove. The wooden entablature gives this holiday home a cosy ambiance, nearly unique on the island. The property also counts with several amenities such as a jacuzzi, a pool as well as a children’s playground. Your vacation in this rustic finca will be an unforgettable experience. ALL PRIVATE for your exclusive use! To move easily around the island a car is essential. We recommend hiring a car directly at the airport. The owner, Johannes, is originally from Austria. He has lived in Tenerife since 2002 with his Spanish wife and his two sons and is happy to share his vast knowledge of the Island with you, providing you with excursions tips and recommendations. The house is far away from the bustling touristic places and you enjoy total privacy while the carefully maintained beaches of Playa San Juan and Alcalá can easily be reached by car within 10 to 15 minutes. The property complies with all the requested security measures and is an officially recognized "Casa Rural" (Country house) by the the Island Council of Tenerife. Hillside retreat with spectacular views! Amazing stay in family friendly hillside retreat. Perched high up with far reaching views over to neighbouring island. Not overlooked allowing complete privacy in terraced garden to enjoy swimming pool, hot tub and there's also a cross trainer to work off some of the holiday excesses! Would definitely recommend and hope to come back! We are really pleased to hear that you enjoyed your stay at the Finca La Mora and would be very happy to welcome you back. Finca la Mora is uniquely located with spectacular views yet almost completely private surroundings, placed on a hill at the very end of a small road in a small city. The house and the pool area are as fantastic, clean and well kept in real life as they are on the pictures at the website. Our host, Johannes, who was both kind and efficient (a rare combo), made everything concerning the pratical stuff completely painless. We even had a change to say hello to the owner of the facility as well as to what might be the most kind dog in the world. The main reason why this is not a five star review despite the many superlatives is an idiosyncratic one: our family had a hard time adjusting to the many (completely harmless) lizards that also consider the house their home. 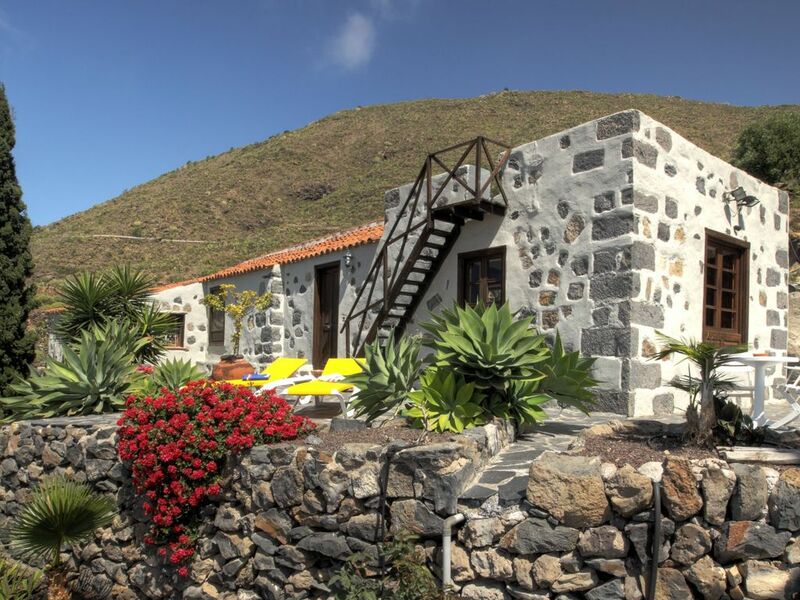 We were so glad we came across Finca la Mora when looking for accommodation in Tenerife. The house is situated in a lovely position with spectacular sea views. The house was very comfortable and clean and the owners were very welcoming. We had an amazing stay here. This was the ideal place for me and the family. We just loved the location. At the perimeter of a small village with all the privacy you can wish for. And the owner respected your privacy although he was most helpful and friendly. The children loved the 2 dogs. My wife is not fond of dogs in a house but these one's stole her heart as they obeyed all her commands, stayed out of the house and followed her everwhere she went outside. The temperature up the mountain is cooler and much more comfortable than down at the seaside. With a swimming pool for the day and a hot tub for the night you do not think of the beach. All you need is food from the supermarket. The rest is there. The photos show you what the place looks like, not modern, but comfortable and clean. You need a car and it is quite a steep drive up the road to get to the place. There are electric gates and the owner will give you a fob to open and close the gates, so no one can wander into the place. The family are already talking of going back. If you want to experience silence and peace, you will have to look far to beat the place. You don't even realise there are neighbours down the road. We have just finished a lovely holiday at this accommodation. Everything was clean and worked well. The owners were very helpful and our children loved the freedom they had here. They collected eggs and played in the garden. It was a real home from home, and I have no hesitation in recommending this lovely house to anyone who wants peace and quiet with stunning views. I hope we can return soon! The holiday home “Finca La Mora” is situated in the small village of Tejina de Isora in the sunny south-west of Tenerife. In this village you will find a small supermarket and two restaurants. In the farmer's market nearby you can buy seasonal fruits and vegetables. It's ideal for excursions to the former abandoned village Las Fuentes, the sunny beach of Playa San Juan, the Cañadas and also to the North. Finca La Mora is situated beside the natural monument “Montaña de Tejina”. You'll stay amidst magnificent nature and pastoral tranquillity. No charge for children under the age of 2. Cots and highchairs are available on demand free of charge. For stays of 14 nights or more, a cleaning service between weeks (change of bed-linen and towels) is included. Kinder unter 2 Jahre sind gratis. Kinderbetten und Hochstühle werden auf Anfrage kostenlos zur Verfügung gestellt. Für Aufenthalte von 14 Nächten oder mehr ist eine Zwischenreinigung (Wechseln der Bettwäsche und Frottierwäsche) im Preis inbegriffen.